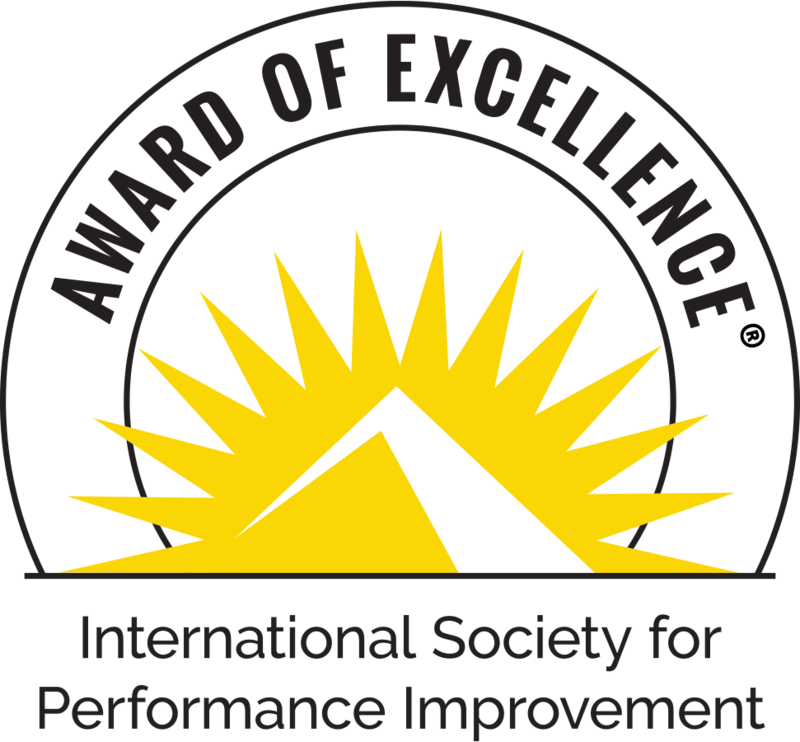 ISPI's Awards of Excellence (AOE) program is designed to showcase the people, products, innovations, and organizations that represent excellence in the field of performance improvement. If you would like ISPI to consider you for an Award of Excellence, review this document and complete the appropriate submission forms. This document does not attempt to teach the research process, nor does it pretend to describe how the methods of scientific research can be applied to various situations. For this reason, the research category relies upon the extensive research background of its Evaluators. Award evaluators are asked to evaluate award applications in light of these criteria, the research questions being asked, and the appropriateness of the research methodology employed in answering them. ISPI wishes to recognize excellence in HPT research without unduly constraining the questions being asked or the methods employed to answer them. This section describes the major categories of research, which we believe are clearly relevant to advances in HPT. The intention is not to endorse one method over another, but rather to open the awards process to a variety of research techniques. The description of these categories should make the point that there are many avenues to rigor, generalizability, and significance. Excellence comes from choosing the right path, and following it thoughtfully. Research in HPT may come in many forms, have more than one purpose, and employ different conceptual models of the research process. This variety would make our awards procedures unmanageable if we had not established some categories and corresponding criteria. These categories may appear arbitrary, and their boundaries may be fuzzy (a given entry may well overlap several categories) and the categories themselves are far from exhaustive. Even so, they summarize years of experience with the Research Award program, and historical patterns of HPT research. In your submission, you will be asked to apply these categories (as we have defined them) to your research project, so that your submission will be that much easier for our evaluators to comprehend. Applied research may be categorized by its purposes, which we list to distinguish research studies from studies that use the same methods of systematic inquiry, but are not research. The most frequent confusion occurs with evaluation. Evaluations test the hypothesis that the outcomes are as the design intended (summative evaluation) or that the tactics employed achieve the intended result (formative evaluation). Rarely do they produce a result that is generalizable to other situations, although the method of evaluation, or its template, may well be of broader use. For the purpose of ISPI Awards, we view evaluations as components of the projects they evaluate, not as independent research projects. A brief description of each type of research is included below. Design-oriented Research seeks to determine the effects of certain design parameters of HPT interventions, the independent variables, on the dependant variable, human behavior or performance. For example, a researcher may examine the effects of various forms of feedback on task performance to decide how much feedback, and what types of feedback, are necessary to achieve a given level of performance. Providing that the forms of feedback are adaptable to other contents and subjects, the results will be generalizable to a variety of settings. Outcomes-oriented Research seeks to compare the results produced by programs or interventions that have the same nominal goals. The purpose of this research is to provide an empirical basis for decision-making in selecting the best possible outcome (Geis & Smith, 1992; Rossi & Freeman, 1993). For example, three companies have developed fire safety courses for their physical plant departments. Now that the companies have merged, the combined company wants to standardize on a single program. An outcomes-oriented study would gather the information to make that decision. If those three programs had been purchased from outside vendors and were generally available, or if they were representative of three recognized approaches to teaching fire safety, the research and the decision would be of interest to other companies similarly situated. Technology-oriented Research concerns the impact of the tools and techniques we use to develop and implement HPT interventions. An example would be comparing the same training delivered in a classroom with training delivered in a virtual classroom over the Internet. To isolate the effects of the technology, all of the design features of the two courses (e.g., exposition, practice, and feedback) would have to be as comparable as possible. Technology may encompass hardware, software, or systematic methods of developing performance improvement solutions. Technology-oriented research is treated as a separately because its purpose often straddles the boundary between Design-oriented and Outcomes-oriented Research. Meta-Analysis Research combines the results of a number of comparable studies to increase the sensitivity and power of the inferences that can be justified by the data. It is especially useful in areas where a number of ambiguous or non-significant results have been obtained in a collection of experiments run by different people at different times and places. A third method of categorization is based on the designs of the experiments. Over time, certain designs have become associated with certain types of study; but, in principle these designs are not bound to a particular question or data type. Starting with the most rigorous statistical designs, we list the types in order, from those capable of the strongest, most objective inferences to the most subjective ones. Whether a design delivers to its full capability depends largely upon the details of its application, so a powerful design inappropriately chosen, or ineptly implemented, may be significantly worse than a less assuming design that is appropriate to existing experimental constraints. We grant that the seventh phase is not always under the control of the researcher. However, utilization of the results is necessary if the research can be said to be “applied.” Furthermore, successful application validates the claims of utility to HPT as nothing else can. To get started, please enter the key contact associated with the submission's e-mail address and click on the SUBMIT button.